In honor of all fallen American soldiers this Memorial Day, a photo of my brother and my niece, visiting Normandy American Cemetery and Memorial in Colleville-sur-Mer, Normandy, France. Photo Friday is hosted every week by DeliciousBaby.com. Hello, thank you for visiting my blog. I can't see your gfc followers but will come back to follow as I could only follow back with networked blogs. Hello, my GFC is now working so I am happy to be able to follow you via GFC. Beautiful! 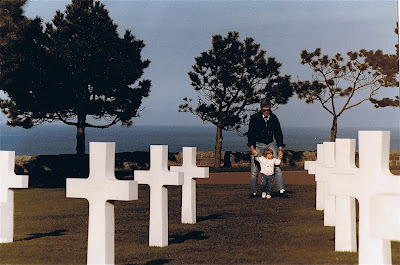 I've never been to Normandy, though my granddad was over there during WWII. That's a beautiful image. Thanks for sharing it.